MLDE are experienced in dealing with Party Wall Agreements as defined under the Party Wall etc. Act 1996. Working from our offices based in Devizes, Wiltshire, our engineering and structural knowledge can be drawn upon and it is this depth of understanding that enables Party Wall matters to be dealt with competently and professionally. We are happy to provide services to Clients as an Agreed Surveyor to draw up an Award on behalf of both owners or to act as a Surveyor's for one of the owners to draw up the award together in conjunction with another appointed Surveyor to enable a fair and practical agreement to be reached. Our structural engineering expertise at MLDE and extensive knowledge of the construction industry allow us to represent our Clients in an efficient manner when dealing with the potentially complex issues concerning the Party Wall Act. Building a free standing wall or wall of a building up to or astride the boundary with a neighbouring property. Works / structural alterations to an existing Party Wall or structure. Excavations within 3 metres (Sometimes 6 metres is applicable) of the neighbouring owner's building or structure. 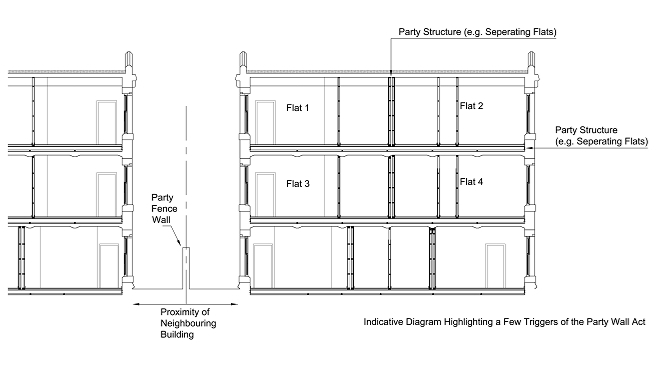 Works to Party structures (This could be a floor or other structure that vertically separates buildings or parts of buildings with different owners, e.g. Flats). It must also be remembered that agreement with an adjoining owner under the Act does not remove the need to apply for Planning Permission and/or to comply with Building Regulations.